Congratulations to our five lucky winners! We can’t wait to see what you create. All of this selfless holiday crafting has got us asking a somewhat selfish question: When will we have time to craft for ourselves? As much as we enjoy crafting for family and friends, we can’t help but love the quiet hours spent in our craft rooms sewing the next piece to include in our me-made wardrobe or practicing our new favorite hobby, hand lettering. Feeling the same way? 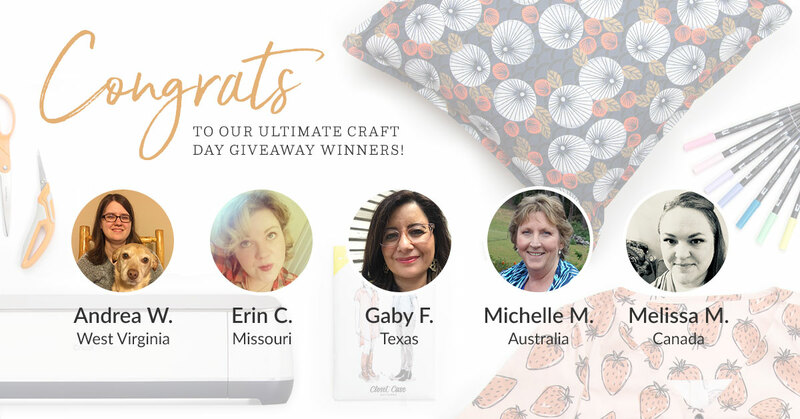 It’s OK because we have the perfect remedy for your crafting blues: The Ultimate Craft Day Giveaway! We partnered with some of our favorite creatives to give away five prize packs with all the essentials for a day of DIY, valued at $1,450! This giveaway was open worldwide Monday, Dec. 18, through Friday, Dec. 22. 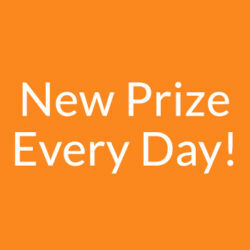 Five winners were chosen at random on Tuesday, December 26. See official rules here. 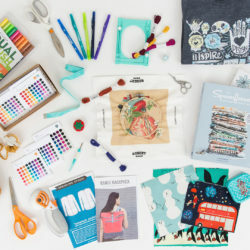 Keep reading to see what goodies make up the best craft day ever and find out which picks the Spoonflower team has in their design tool box. Ready to learn how to quilt in 2018? Fabric Play: Sewing Mojo Minis with Suzy Williams of Suzy Quilts is the Craftsy class for you! Craftsy brings together the world’s best instructors, most passionate enthusiasts and most inspiring ideas to help creative people everywhere do what they love best, even better. A front-row seat with world-class instructors. The chance to ask questions and get personal answers! The ability to watch anytime, on any device, forever. Choose from hundreds of classes in your favorite crafts. 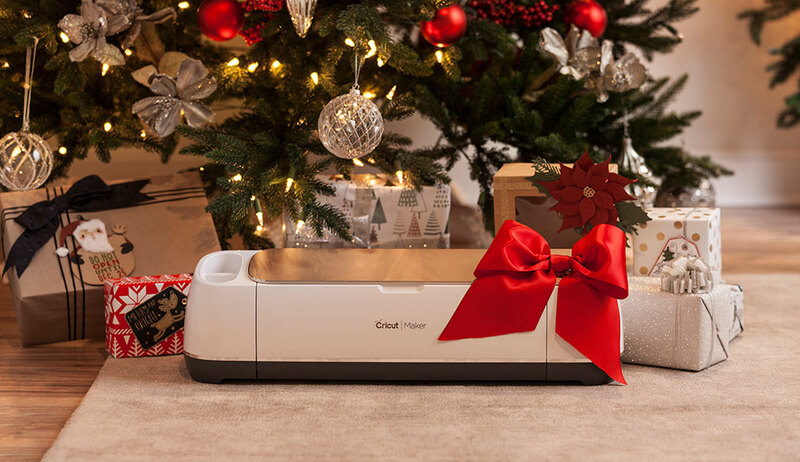 Meet the Cricut Maker – the ultimate smart cutting machine. It handles fabrics, leather, and balsa wood with effortless precision. Cut your sewing patterns in just a few clicks and place more creative possibilities than ever at your fingertips. Are you ready to say hello to your new crafting bestie? Spoonflower PRO is a premium service for small business owners, frequent orderers, and anyone who loves Spoonflower. Try it out for three months and receive FREE standard shipping on all orders, half price swatches and more! 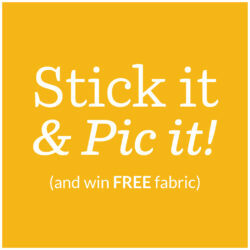 Now that you’re a proud owner of a Fiskar’s prize pack, you’ll want to put those craft supplies to good use! Why not test out your paper skills with a year’s subscription to the wonderful world of Lia Griffith? Annual membership to LiaGriffith.com allows you to find your creative happy place from the comfort of your own home. Enjoy access to their library of over 2000 DIY downloads plus 40 brand new projects to handcraft at home every single month. Annual members can also enjoy live online workshops, exclusive giveaways and a special gift on your birthday! 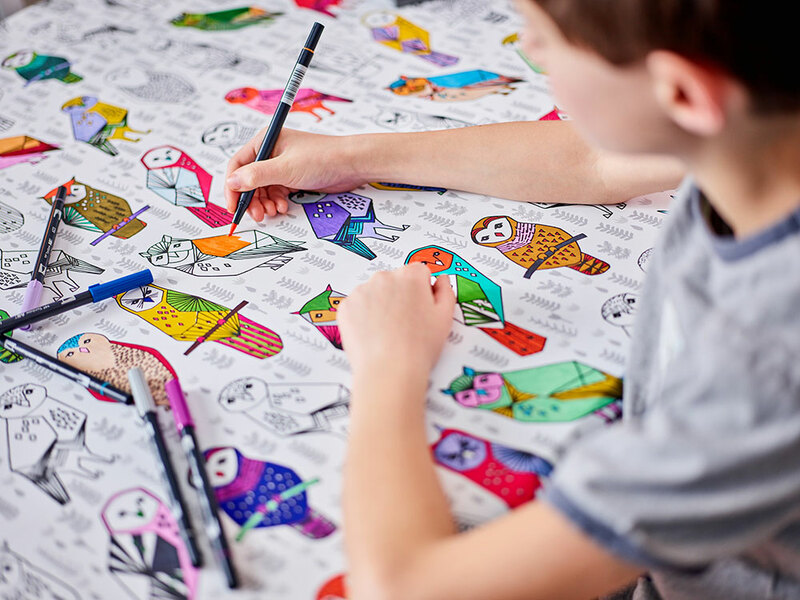 For Allison Sloan Polish, Spoonflower’s president, the only things she needs for a Friday night in is a roll of coloring book wallpaper, a set of Tombow markers, and of course, her three wildly creative young boys. The Polishs quickly fell in love with Tombow markers when they turned an old craft table into a dream coloring station and now they want you to experience the fun too! 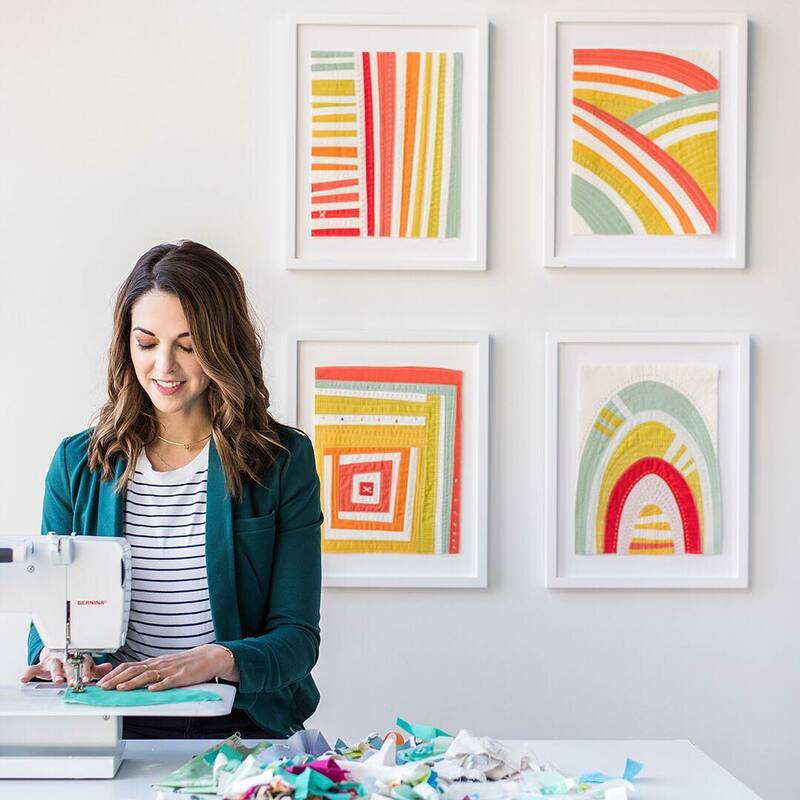 It’s no secret the Spoonflower team is comprised of talented makers pursuing their personal passions outside of the office. Just take one look at Katie Berman’s studio and you’ll be in fiber heaven. 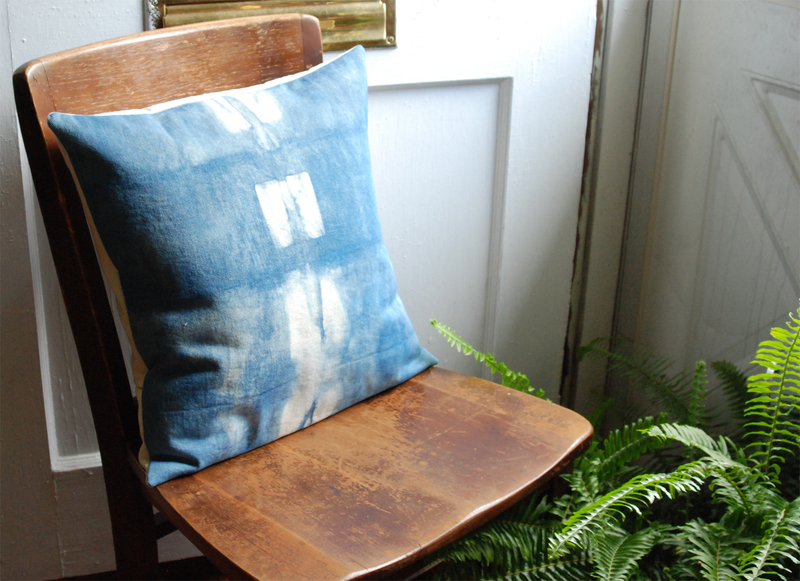 When she’s not planning events and making most of the samples you see in the Spoonflower magazine, Katie is busy being the one-woman show behind Redden Goods, a collection of responsibly made textiles for the home through traditional methods of fabric construction and dyeing. 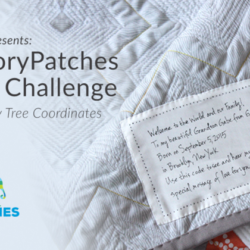 If you haven’t tried out our sister site, Sprout Patterns, you’re in for a DIY treat! Sprout is a service that offers sewing patterns that you combine with Spoonflower designs to create customized cut and sew projects. They take out all the work of putting a sewing pattern onto fabric and leave you with the fun of creating garments and accessories. For your ultimate craft day, choose your favorite sewing project from over 122 patterns, including Sprouts’ newest patternmaker, BurdaStyle, and start creating a handmade wardrobe today! 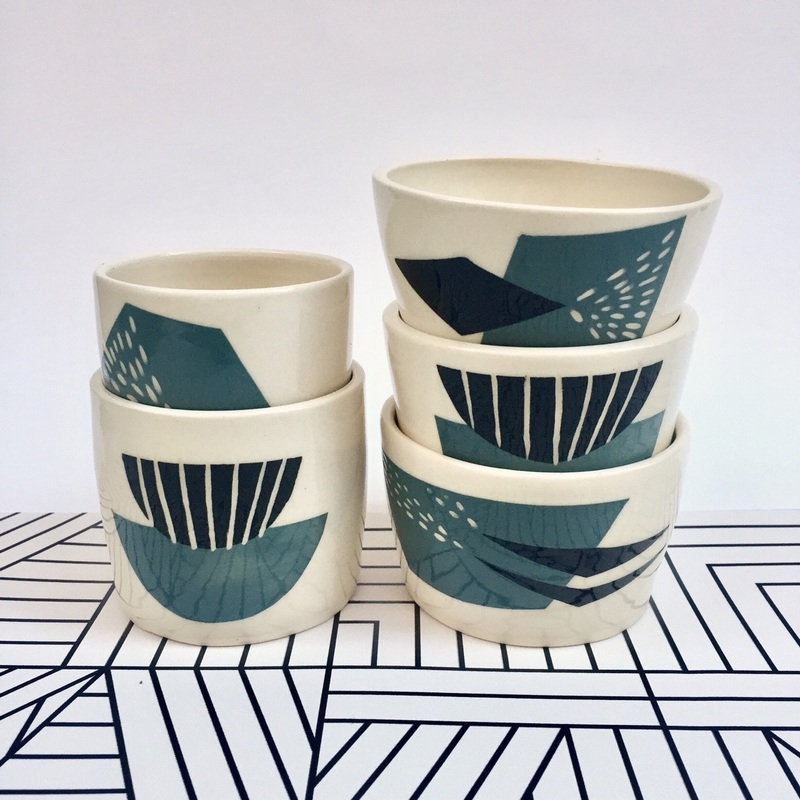 Earlier this year, Jenna Leitner, the creative behind Pink Moon Ceramics (and former Spoonflower employee!) stopped by the blog to share some of her tips and tricks for flawless product photography. Today she’s back for our ultimate craft day giveaway! Whether you try your hand at raising succulents or create a mini fairy garden, we hope that Jenna’s self-taught passion inspires you to try something new. If there’s one crafty trend we can’t get enough of this year, it’s enamel pins. Whether we’re pinning them onto our handmade denim jackets or wearing them loud and proud on our backpacks, enamel pins let everyone know that you’re crafty and you know it! 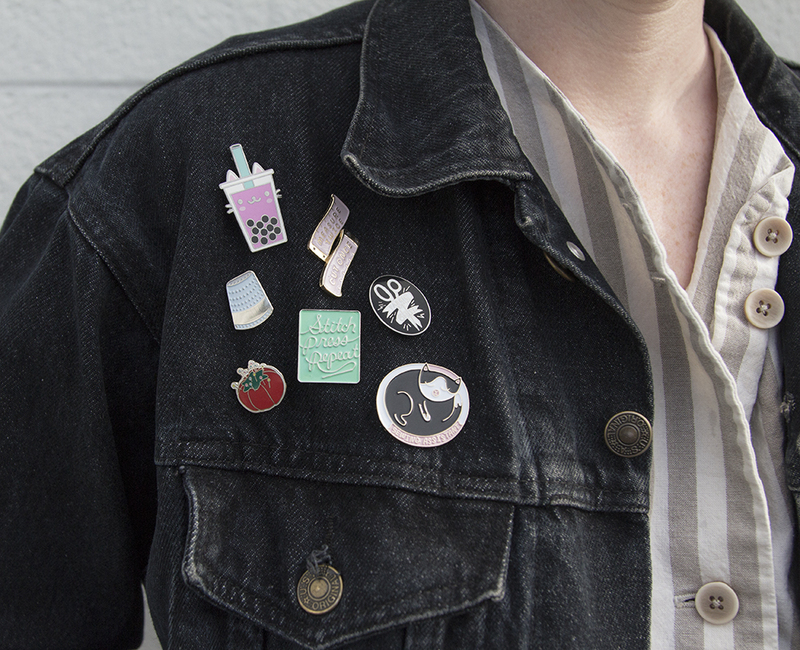 Complete your ultimate craft day wardrobe with a collection of pins from some of our favorite crafters. 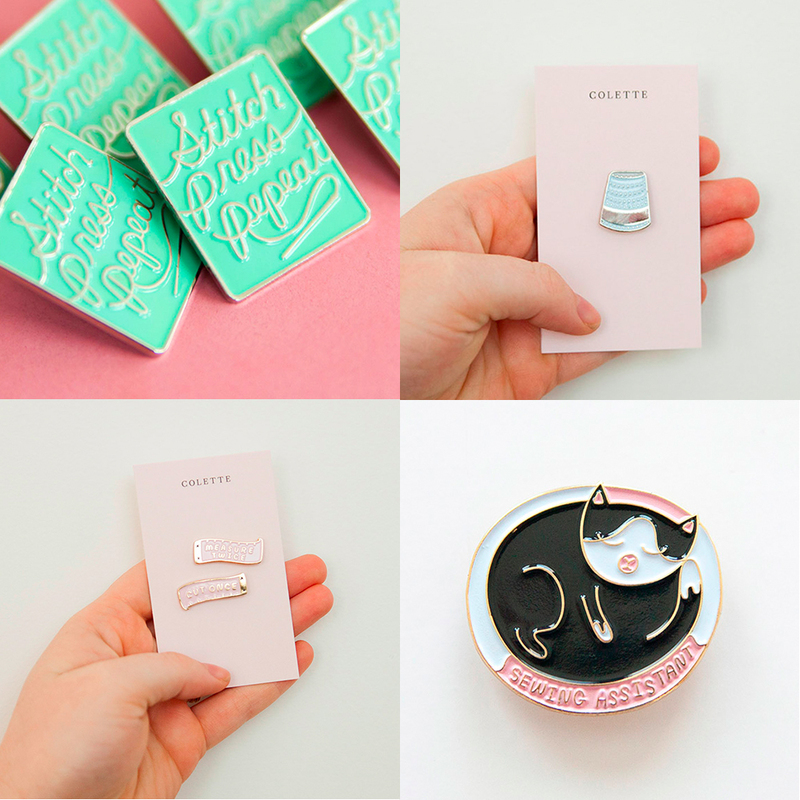 Enamel pins featuring a thimble, the mantra “Stitch Press Repeat”, a ruler of wisdom and a furry sewing sidekick from Colette Patterns will keep you company as you craft your next masterpiece. Every sewist will know that fabric scissors are meant to cut one thing and one thing only: fabric. Protect your scissors and help spread the message with the Fabric Only pin by Lauren Schenkel of ARTSandSTRIPES. She’s even throwing in another classic sewing tool, the Tomato Pin Cushion to complete your ultimate craft day accessory collection. 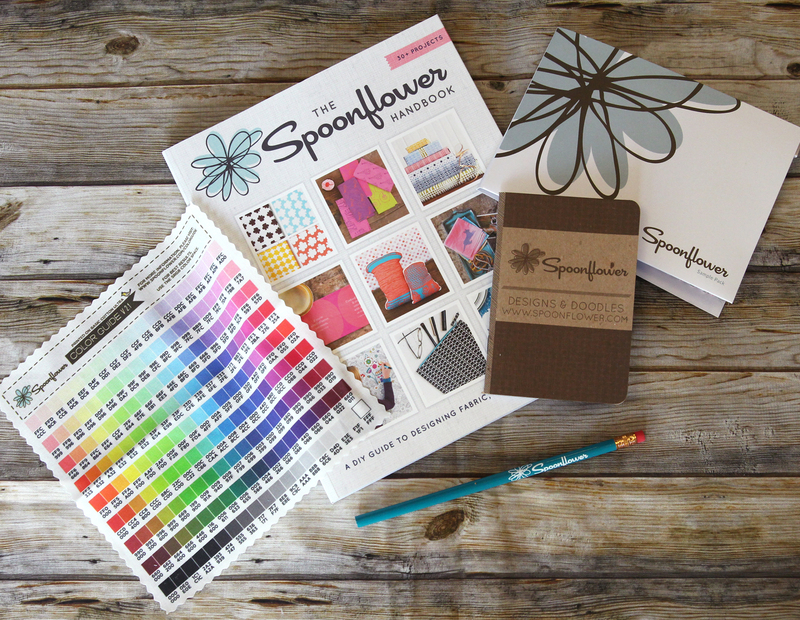 We love getting to see how Spoonflower designers use their surface patterns as inspiration for other handmade goods. Just take Lindsay Gibson of emandsprout for example. 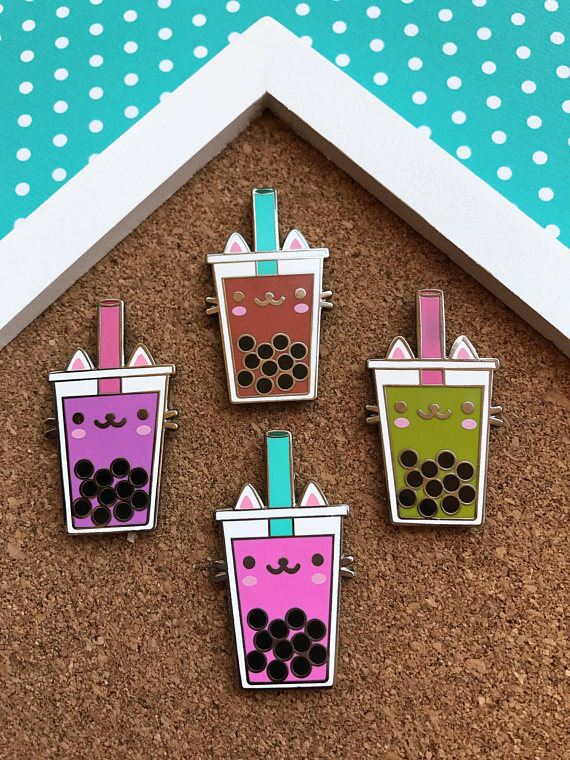 Her Boba Tea design on Spoonflower has been transformed into the sweetest treat, a Boba Cat enamel pin! “For the Love of Spoonflower” was the popularly-voted winner of the 2017 Spoonflower T-shirt design challenge. 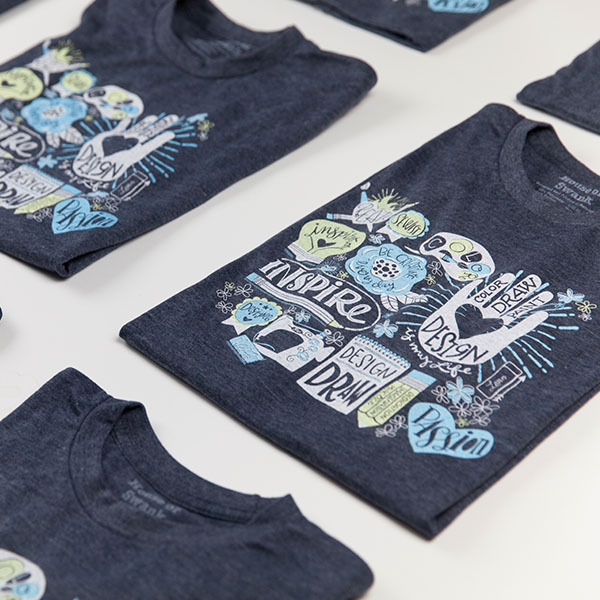 On any given day at the Spoonflower office, you’ll find a handful of team members sporting this ultra-soft tee. Screenprinted locally on luxuriously soft fine knit jersey, this unisex shirt is available in sizes S-2XL. Paired with your new enamel pins, no one will be mistaken of your favorite hobbies! Are you ready to organize and prioritize your sewing queue for a unique me-made wardrobe? This stylish and practical sewing planner from Colette Patterns is spiral bound with a wrap-around hard cover. Measuring 7X9 inches, it’s easy to carry with you to use whenever inspiration strikes. What sets this planner apart is its versatility. Are you a visual person? Then draw your ideas on gridded sketch pages with the help of their croquis. 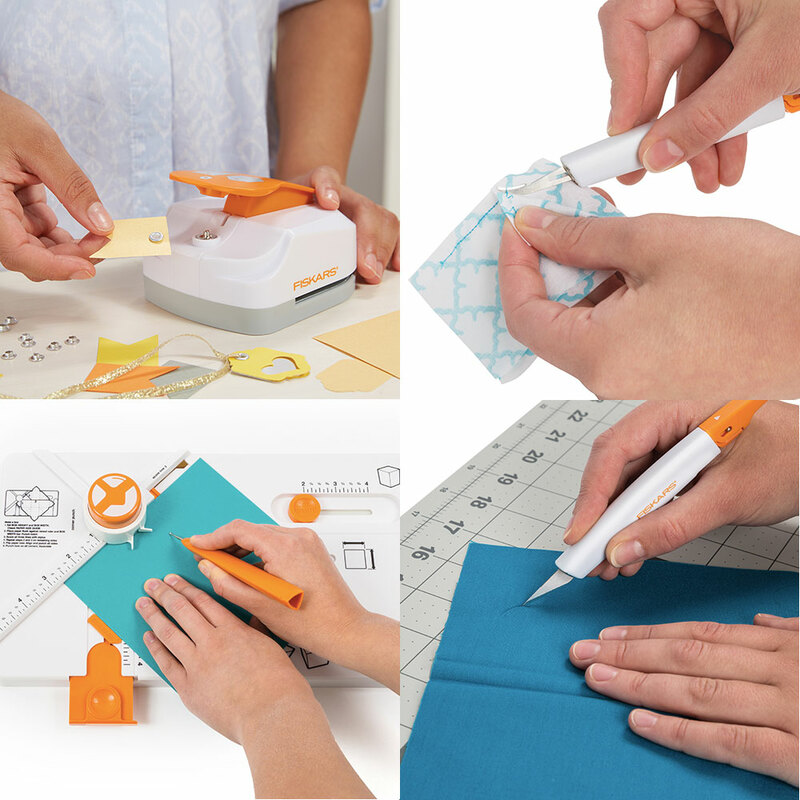 Do you take notes while you sew? Then fill your book with fitting ideas that will help guide you with future projects. 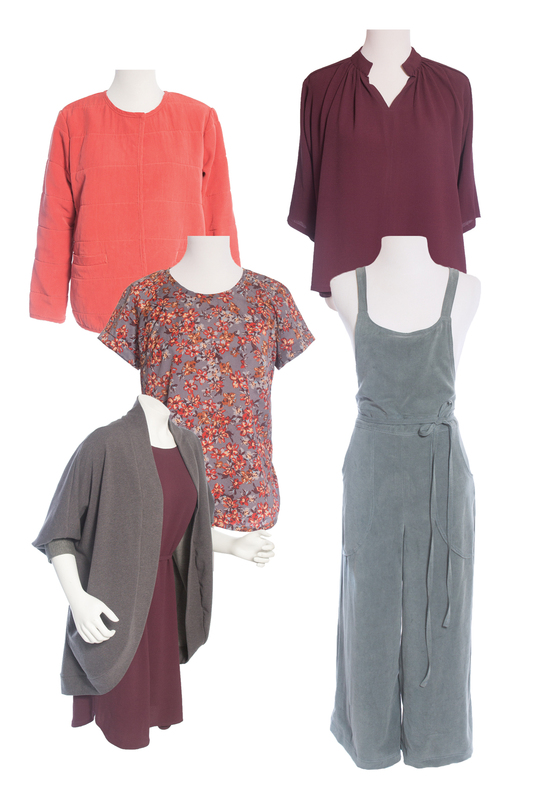 The Fall/Winter collection from Indiesew includes five sewing patterns you can mix and match to create a small cold-weather capsule wardrobe. 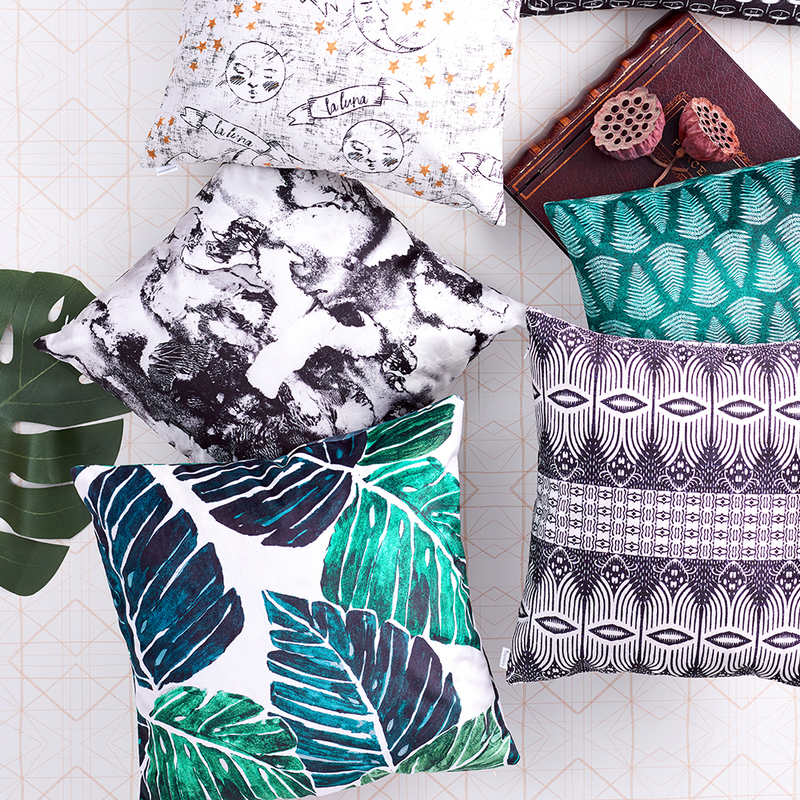 Now that all of your handmade gift making is complete, it’s time to treat yourself to a new indie pattern, thanks to our friends at Indiesew. 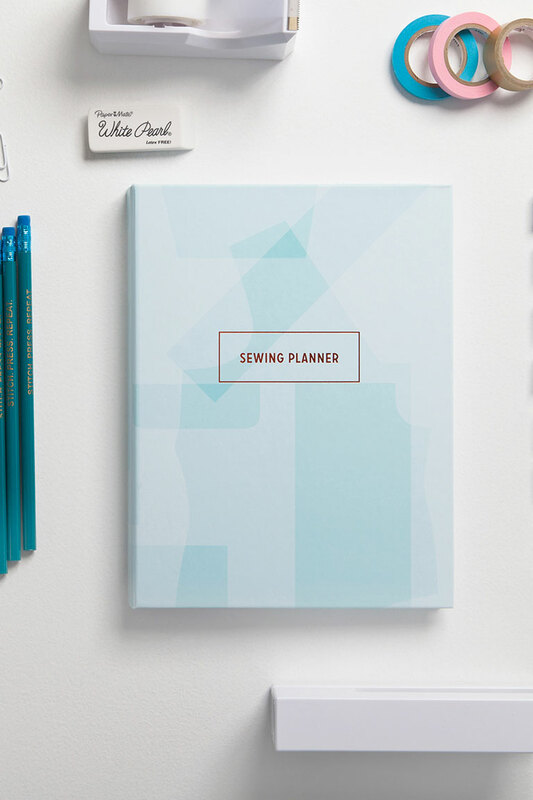 Indiesew strives to provide the highest quality sewing patterns created by independent designers to sewing enthusiasts in a manner that fosters creativity and connection among the online sewing community. 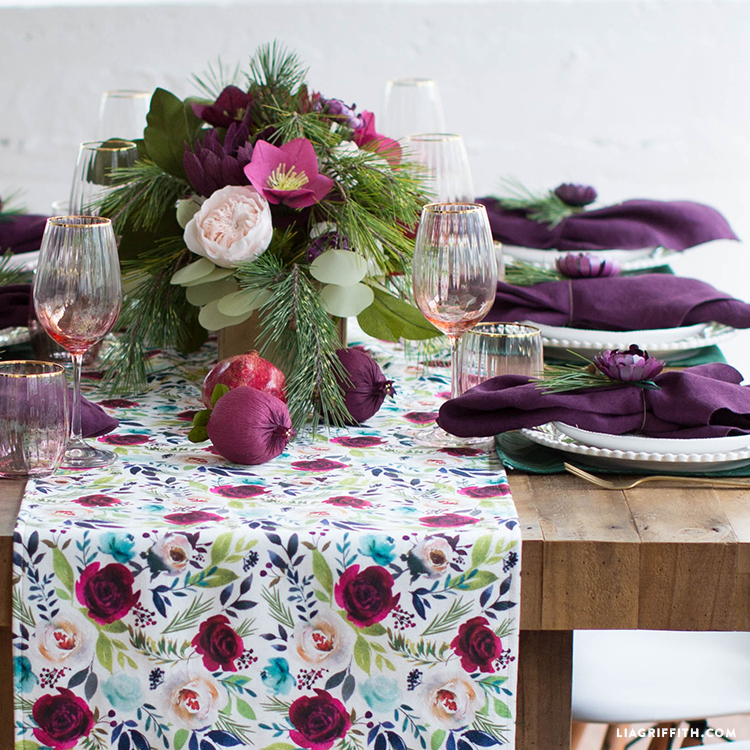 During your day of DIY, you’ll be able to outfit your crafting space in custom home décor that pops with a little help from our sister site, Roostery. 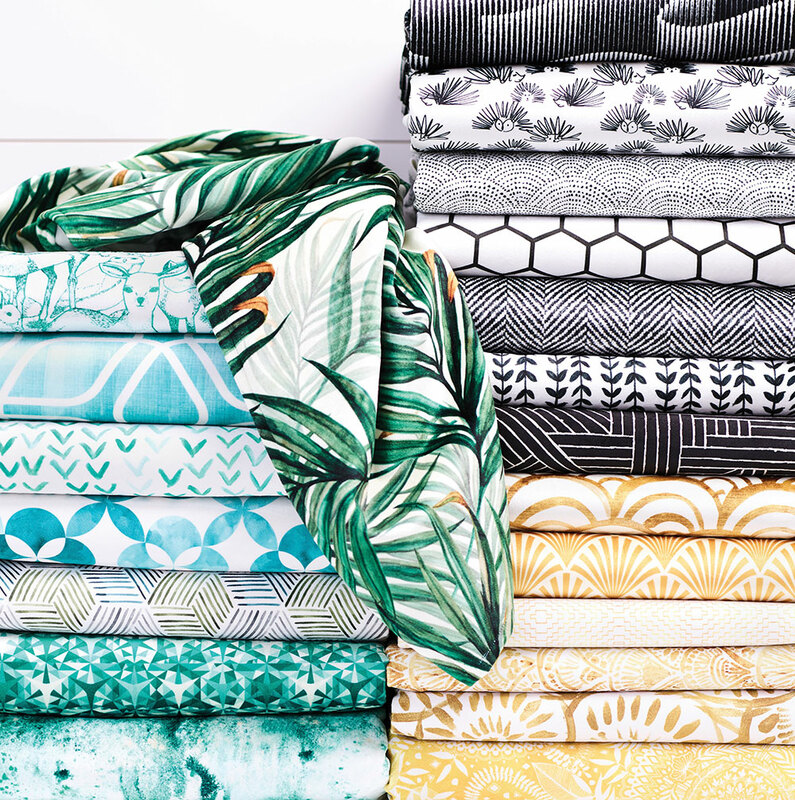 From pillows to placemats, and everything in between, you’ll be able to pair your favorite Spoonflower Marketplace design (or your own!) with one of Roostery’s finished goods. This is the one time we give you the A-OK to skip the DIY! This giveaway was open worldwide Monday, Dec. 18, through Friday, Dec. 22 at 11:59 p.m. EST. Five winners will be chosen at random on Tuesday, December 26. See official rules here. Please pick me for this super wonderful ménage of fabulous things! What a great assortment of crafting goodies! I would love to win! What a great way to start the new year with a surprise gift. I am so sorry and I hope that If you do get this kit that it brings you much joy. I never win anything, but I so want to win! This would be dream come true to win!! Wow! Wow. How generous. Whoever wins will be very lucky. AWESOME prized, Spoonflower! Happy New Year to everyone! 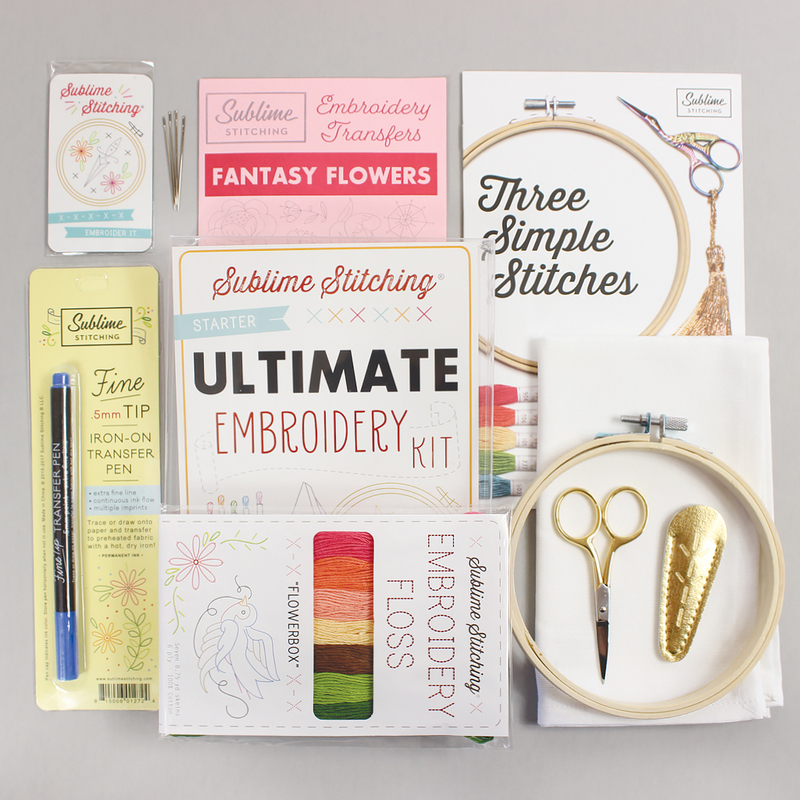 What a wonderful hodgepodge of crafting supplies, the winner would surely love everything in this bundle. Happy Holidays! So many wonderful items – would absolutely love to receive this prize package! WOW! I agree with the other commenters, this is quite the collection of fabulous! I’d love to win, but makes me happy thinking about anyone receiving this! Good stuff! This is an absolute fantastic giveaway! I would LOVE to win this and use the products to craft with my 4 kiddos and 3 stepkids! Amazing goodies. Would love to win. Would love to win any or all of the items listed. What fabulous prize bundles! Wow! What a great selection! Exciting! Just watched the Cricut Maker video… WOW. I had no idea someone could do so much with it. Winners were contacted on December 26 and we’ll be announcing them to the public mid-January!